alaTest has collected and analyzed 232 reviews of Panasonic SDR S50. The average rating for this product is 3.9/5, compared to an average rating of 4.0/5 for other Camcorders for all reviews. Opinions about the size and portability are generally positive. The price and zoom are also mentioned favorably, but some have doubts about the durability and battery. Views are divided on the image quality. We analyzed user and expert ratings, product age and more factors. 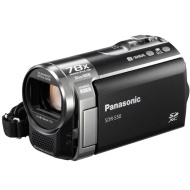 Compared to other Camcorders the Panasonic SDR S50 is awarded an overall alaScore™ of 84/100 = Very good quality. alaTest has collected and analyzed 93 user reviews of Panasonic SDR S50 from Amazon.co.uk. The average user rating for this product is 3.8/5, compared to an average user rating of 4.0/5 for other Camcorders on Amazon.co.uk. People are impressed by the portability and image quality. The price and zoom are also mentioned favorably. alaTest has collected and analyzed 47 user reviews of Panasonic SDR S50 from Amazon.com. The average user rating for this product is 4.0/5, compared to an average user rating of 3.9/5 for other Camcorders on Amazon.com. Reviews about the size and price are generally positive. The portability and usability also get good reviews, but there are some critical comments about the image quality. The Panasonic SDR-S50 standard-definition camcorder is worth considering for its manual controls and powerful zoom lens in a very compact body--not video quality. If your budget can't stretch to HD, but you still want a well specified camcorder, this is definitely one to consider. The Panasonic SDR-S50 camcorder is a standard definition camcorder with some neat tricks to share. My husband just bought this camcorder for me for Christmas, and I love it. It takes great videos, is easy to use and has so many options. This camcorder is also a camera, and take amazing pictures! iT HAS A 78x ZOOM. Using an SDXC/SDHC/SD memory card for recording media, the compact SDR-S50 is ideal for daily use. Its superb resistance to external impact combines to give this versatile camcorder easy portability for anytime, anywhere video fun. Video clips recorded on an SDXC/SDHC/SD memory card can be played by simply inserting the card into the card slot of a Panasonic VIERA TV. This compact camcorder features a powerful 70x optical zoom lens with an enhanced optical 78x zoom function that uses the effective area of the CCD to further extend their zooming power at the wide-angle setting. This makes it possible to capture beautiful images of sweeping landscapes and pull in distant subjects for truly dynamic close-ups. Because hand-shake becomes increasingly noticeable with more powerful zooming, an optical image stabilizing function is essential for suppressing hand-shake and providing clear zoom shots without degradation. This is where advanced O.I.S. comes in. It detects and corrects hand-shake at a rate of 4,000 times per second, to provide stable images while zooming. Plus, the addition of an active mode produces clear, blur-resistant images even when shooting while walking. The 33mm wide-angle setting is especially convenient when shooting video indoors or in tight spaces. It makes it possible to shoot at a close distance from the subject while fitting both the subject and the surrounding area into the frame. This has the added benefit of allowing the voice of the subject to be clearly recorded, which is an important element in video recordings. The wide-angle setting captures beautiful images of wide landscapes and allows large groups of people to fit into the frame. The iA function includes an AF/AE tracking feature that tracks a moving subject to make sure that it continues to be recorded in optimal image quality. A intelligent contrast control, which automatically adjusts brightness to maintain the best possible contrast, has also been added to the five advanced functions from previous models, including face detection, advanced O.I.S., and intelligent scene selector, and each is activated as required by simply pressing the iA button to capture beautiful images under virtually all shooting situations. Optical Sensor Size:1/8 / 1/8"